Ever have one of those mornings were its chilly outside but nice and warm in your bed; your pillows are perfectly squished and arranged for optimum comfort; your comforter is feeling especially fluffy and cuddly; and overall, you are just too stickin’ comfortable to think of getting out of bed?? Today was one of those mornings. I would have sacrificed a small, annoying child to be able to stay in bed all day. Unfortunately, I don’t know any small, annoying children. 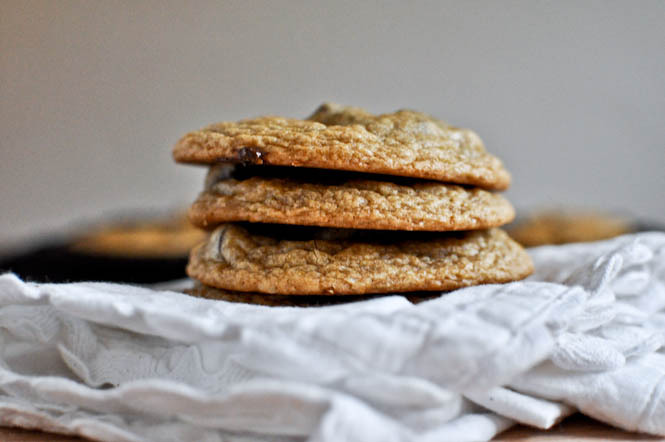 Also, I had 2.5 dozen of these cookies in my kitchen and if I did not bring them to work this morning, I would get up later in the morning just long enough to bring at least one bag of these back into bed with me where I would curl up and eat them all. This is another Howsweeteats.com recipe. 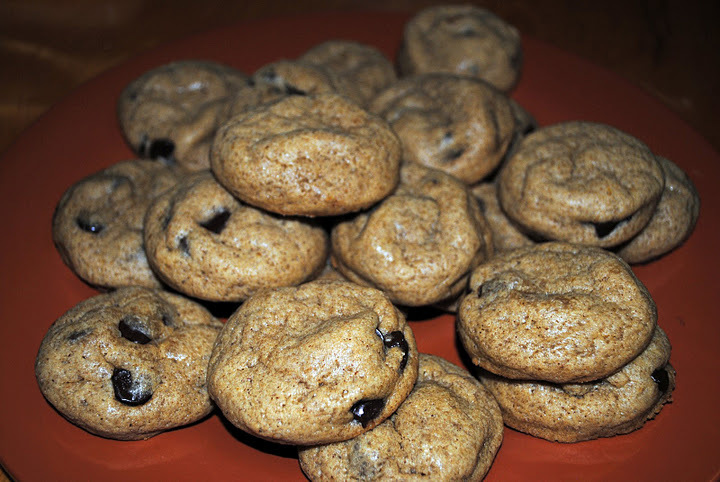 She posted it last week and I was intrigued by the idea of a flat, chewy pumpkin cookie as opposed to the soft cake-like version I had made last year. Well, mine were not flat or chewy. My cookies were definitely more cake-like. When we look at the side-by-side comparison here that I have conveniently provided for you, we can clearly see mine are way too soft and pillowy (much like my pillows were this morning *Sigh*). I suspect the egg substitute had something to do with that. Maybe next time, I’ll try replacing the eggs with applesauce instead and see if that works. They still tasted amazing, though! Mix the flour, salt, cornstarch, pumpkin pie spice and baking soda in a bowl and set aside. 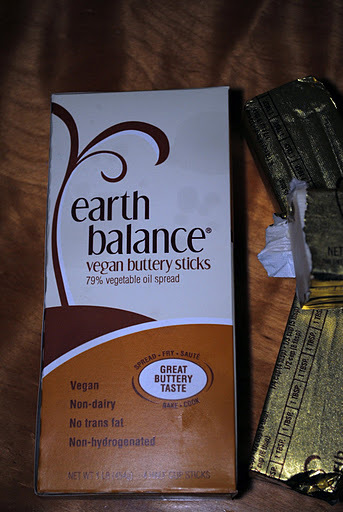 In another bowl, mix the melted vegan butter and sugars until they are combined. Add the egg replacer, egg yolk replacer, and vanilla and stir until mixed. Stir in pumpkin butter until smooth. Gradually add flour mixture and mix until a dough forms – it will look crumbly at first, but it will come together. I even used my hands to help at one point. Fold chocolate chips and chunks. Refrigerate dough for 30 minutes, then roll into golfball-sized balls. 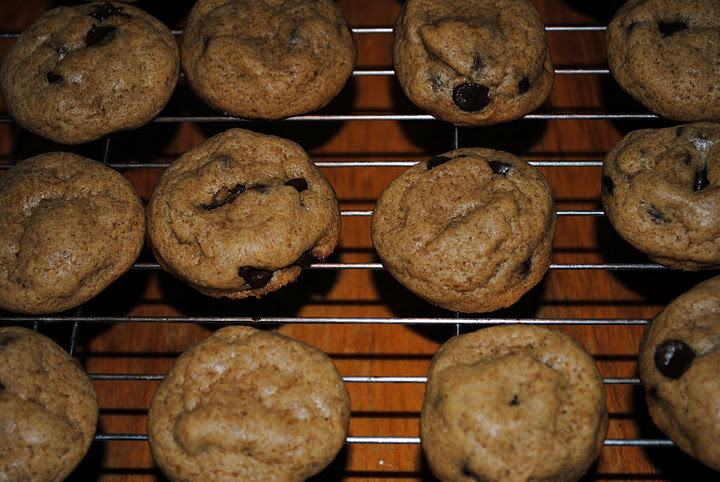 Bake for 12-15 minutes, or until cookies are crisp and slightly golden on the edges, then let cool completely. 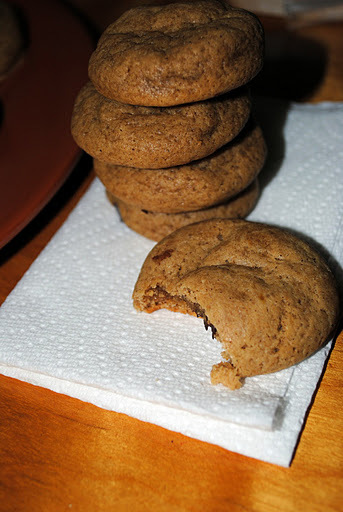 So, these cookies are definitely delicious (my roomies were raving about them!) but I have to be honest- Pumpkin Butter was about $7 for 3/4 of a cup. Not terrible if you are making one batch of these. If you are crazy though, and decide to tackle 2.5 batches of these on a Sunday night, I would suggest going the pumpkin puree route. It’s cheaper and the pumpkin butter didn’t make a huge difference when you make the cookies vegan. Yummy cookies! Glad you brought them in 🙂 I made some non-vegan pumpkin cookies this weekend, and subsituted applesauce for the cooking oil-delicious!